The top trends in out of home advertising are in and while some of the findings are surprising there are some findings which confirm the visceral feelings that many of us have in the industry. One of the trends that excites us at Abraxas Technology is the growth of Digital Out of Home (OOH) media. Digital Out of Home (OOH) marketing is going to account for 39% of total revenue of all out of home marketing by 2019. It is not hard to imagine how Digital OOH is going to impact the industry. There have been a lot of thoughts on this, but allow us to add to the plethora of conjecture. It was not too long ago that digital billboards and signage accounted for around 1% of the entire OOH market. Today that figure stands at 5% and it is unlikely that the industry is not going to continue to add and replace analog billboards with digital ones. Therefore, one of the major trends that we believe is going to be seen moving forward is pricing models that are reflective of those that we find in online advertising. One such pricing model can be based on timing, however that model will only be expanded on with third party data that is being collected, aggregated, and disseminated. But, imagine a world where digital billboards and signage show different advertisements that are based on who is going to see them in the next minute versus what demographic normally drives during a certain time. Abraxas Technology makes this not just conjecture, but a reality. 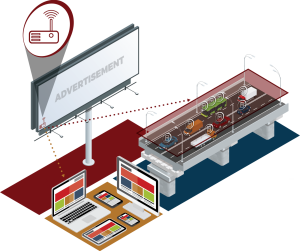 By using our solution, digital OOH owners can use a pricing model that is more inclusive but does not reduce total revenue or value of the billboards and signage, while advertisers can more effectively use their ad spends and thereby spend less per campaign while having a greater ROI on customer conversions.